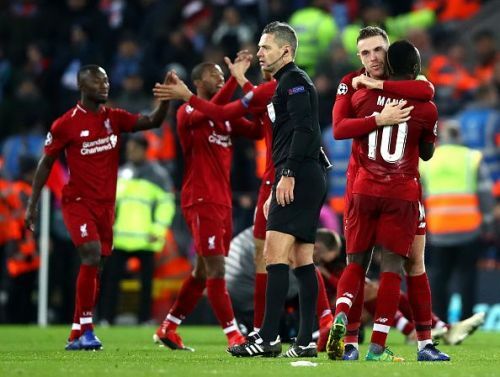 Liverpool secured their qualification to the UEFA Champions League knock-out stage courtesy a tense 1-0 victory over Napoli. Presented with the task of beating Napoli at home, Jurgen Klopp’s side came up trumps when it mattered most. Like many a times before, Mohamed Salah proved to be the difference between the two sides with his goal in the 34th minute being his 9th Champions League goal at Anfield. Napoli pushed for an equaliser late on but weren’t able to unlock a stubborn Liverpool defence. With PSG’s victory, the Italian outfit were consigned to a place in the Europa League. Napoli arrived at Anfield on Tuesday night boasting of an unbeaten record in the group. Having drawn away to PSG, many believed Napoli to ruffle the Reds’ feathers in the crunch encounter. However, the Italian outfit failed to find any rhythm to their game and much of it was down to Liverpool’s energy. Klopp’s charges adopted a high-energy, high-pressing approach to not allow the Napoli defenders a moment’s peace. 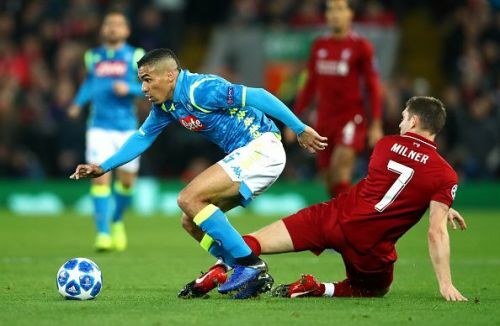 Moreover, the Reds’ midfield trio of Henderson, Milner and Wijnaldum ensured that the likes of Allan and Hamsik didn’t get the time or the space to pick defence-splitting passes. On numerous occasions, Napoli tried to play out from the back and through Liverpool’s press but they failed miserably. The Italian outfit were guilty of digging their own grave on several occasions and the margin of defeat could’ve been much greater if not for Liverpool’s profligacy in front of goal. Napoli’s entire gameplay is based on quick passing and movement off the ball. However, the Reds, courtesy their relentless energy, ensured that the away side couldn’t get a foothold in the game and get their passing game going. The Reds emerged victorious on the night and their ability to press their opponents into submission played as pivotal a role as any. Thus, the Liverpool team needs to be given credit for being brave enough to pull off such a tactic in a do-or-die game.